The Most Important Chart Right Now (And Why It’s Bullish For Gold Miners….) 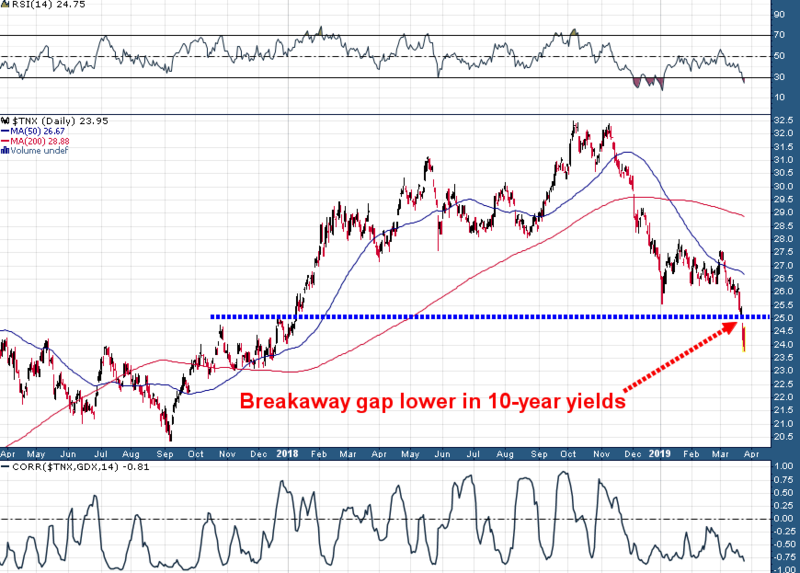 | Energy and Gold Ltd.
Last Friday’s market turmoil created a gap in the chart of 10-year Treasury yields and the resulting technical breakdown has all the key characteristics of a “breakaway gap” . A breakaway gap in 10-year Treasury yields is not a common occurrence – in fact it’s so rare that it likely means that 2.25% is a minimum near term downside objective in the 10-year, and in all likelihood this tremendously important Treasury Note yield is headed all the way down to the 2.00%-2.10% over the next couple of months. While this downtrend in bond yields may be bad news for future economic growth and various equity market sectors, it is very good news for precious metals and gold miners. At the bottom of the above chart I added the 14-day rolling correlation between the GDX exchange-traded fund and 10-year UST yields – this correlation is up to an 81% negative correlation which means that as yields continue to tumble the gold miners should continue to rise. This strong negative correlation between gold miners and Treasury yields has been in place since December and appears to only be gaining strength. DISCLAIMER: The work included in this article is based on current events, technical charts, company news releases, and the author’s opinions. It may contain errors, and you shouldn’t make any investment decision based solely on what you read here. This publication contains forward-looking statements, including but not limited to comments regarding predictions and projections. Forward-looking statements address future events and conditions and therefore involve inherent risks and uncertainties. Actual results may differ materially from those currently anticipated in such statements. The views expressed in this publication and on the EnergyandGold website do not necessarily reflect the views of Energy and Gold Publishing LTD, publisher of EnergyandGold.com. This publication is provided for informational and entertainment purposes only and is not a recommendation to buy or sell any security. Always thoroughly do your own due diligence and talk to a licensed investment adviser prior to making any investment decisions. Junior resource companies can easily lose 100% of their value so read company profiles on www.SEDAR.com for important risk disclosures. It’s your money and your responsibility.